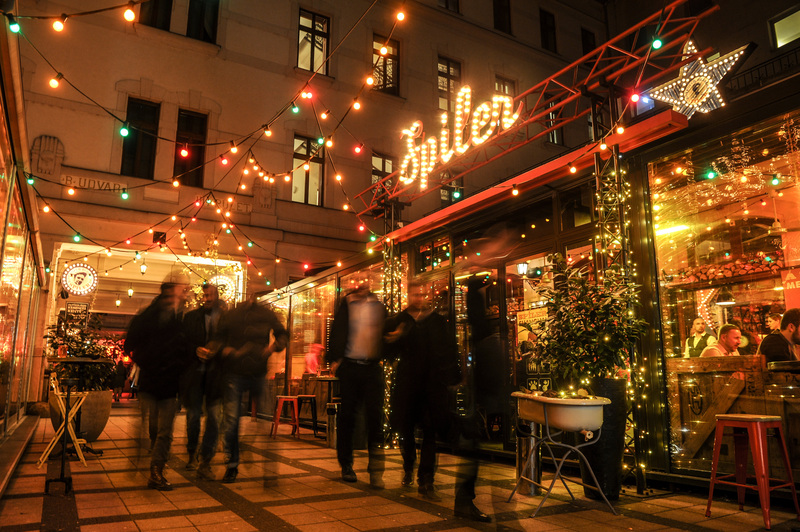 Budapest, Hungary, 2018-Dec-07 — /Travel PR News/ — In Gozsdu Court’s 200 meters of pedestrian only promenade is occupied with bars, restaurants and bistros – a proud 33 of them. That makes an eye-whopping one bar for every 5 meters, and hence the highest density of nightlife in Europe. No wonder that out of 4 200 000 tourists visiting Budapest 1,5 million have taken the pilgrimage annually here to have breakfast or sit a coffee in one of the chic art nouveau terraces or enjoy all the sins as the night approaches. Add another 1.5 million Budapestine who melts in to end up to the most eclectic mix of crowds. No wonder that Gozsdu became an attraction on its very own right. 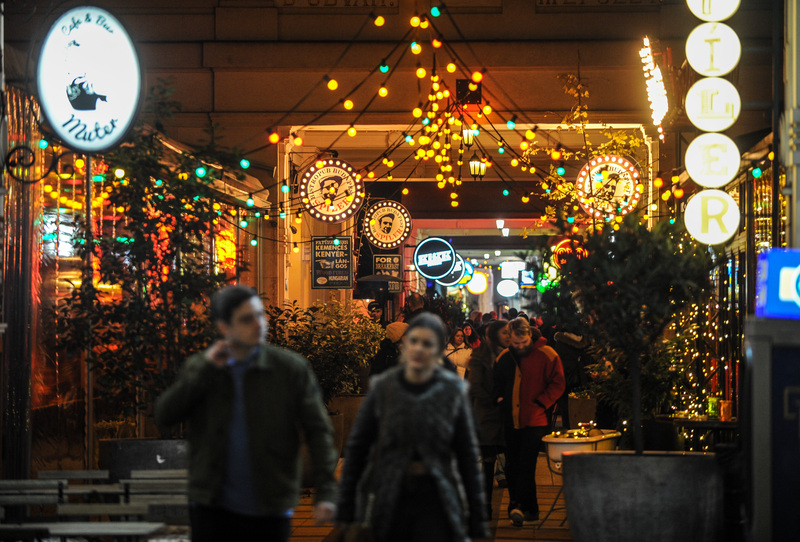 Some of the finest established and up and coming names of the creative industries – both national and international have set up shops: advertisement agencies, design studios and you name it fill up the neighborhood and providing the clientele of Gozsdu’s gastro temples in lunchtime. What makes Gozsdu a truly exotic ecosystem is the five storey, 150 year old apartment houses towering above the bars and restaurants hosting hostels, Airbnb spots and residential flats. Nowadays Gozsdu Court became one of the main tourist attraction and the new „Covent Garden” of Budapest due to its cafés, restaurants, vineries and open shopping street which is unique in Budapest. 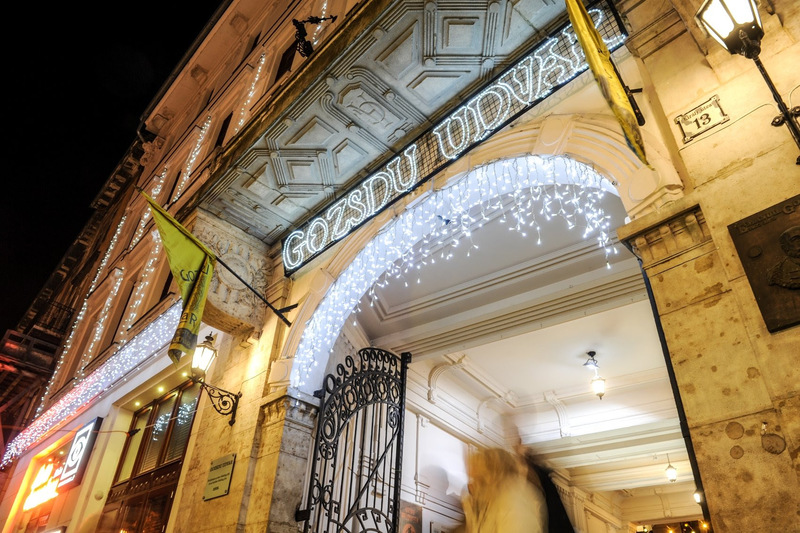 Gozsdu Court is one of Budapest’s most impressive building complexes. There is also a Courtyard of apartments where party-lovers can be accommodated. Gozsdu Court used to be a special meeting place for Hungarians but in the last couple of years it became a well-known tourist attraction where special Hungarian dishes and international cocktails live side-by-side. Blue Bird Karaoke Rooms is a unique space that combines restaurant, bar and Budapest’s newest and largest karaoke venue with 5 creative private rooms. The history of one of the most impressive residential buildings of the city dates back to the beginning of the 20th century. The building complex consisting of seven buildings and six courts connecting 2 streets. The beautiful facade of the buildings constituting Gozsdu Court were restored to their original appearance. Its history dates back to the year 1900, namely the Gozsdu Foundation established by Emanuel Gozsdu began to cause to design the building in that year, and then, two years later, it started to cause to construct it. The design of the Gozsdu Court was produced by Győző Czigler, a University professor and an eminent architect of that age. Together with the building, the erstwhile imposing row of shops are as well renovated; the unique passage to come into existence this way is provide a special forum for craftsmen and artists of fine arts. The chain of courts interconnecting the Kiraly and Dob streets are formed by seven buildings and by six courts enclosed by the buildings. This peculiar and unique passage interconnects and interlaces both downtown streets running parallel to one another, by forming a kind of chain of passageways leading through the buildings. The staircases of the building blocks will open out of the valuated passageways. The erstwhile and existing shops, respectively, open into the atriums and partly they are situated under the vaults. The imposing row of shops of the Gozsdu Court are renovated as the four-storied building blocks. On the upper floors, apartments of luxury standards are developed, and the shop premises are accommodate restaurants offering special gastronomic experiences, the vineries specialized in Hungarian wines and shops offering various services required by modern lifestyle. The Gozsdu Court is renovated by preserving its original and exclusive trait so that it should also meet all requirements laid on modern living places. The restoration of the building is also created the possibility of implementing the Madách promenade. Thus, this part of the downtown, which was declared by the UNESCO to be part of the World Heritage, became richer by a really impressive building complex. This entry was posted in Entertainment, Festivals and Events, Food & Drinks, Recreation, Tourism, Travel, Travelers and tagged bars, bistros -, Budapest, Gozsdu, Gozsdu Budapest, Gozsdu Court, Gozsdu Udvar, Hungary, restaurants. Bookmark the permalink.